Kia Ora (that’s Maori for hello or welcome). Waitangi is just north of us in Paihia and is historically the most important place in NZ due to the signing of the Waitangi Treaty there in 1840. 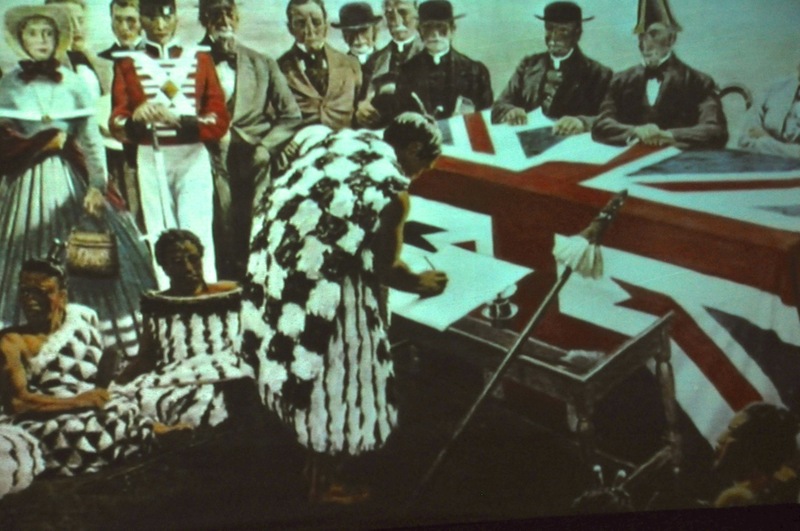 This treaty bestowed British citizenship on the Maori and subjugated them to British law while supposedly protecting the Maori’s land and interests. As I mentioned in an earlier post, this document is central to current day discussions over land issues. Kiwis see this as the equivalent of the US Constitution. Maori see this as a very different document than the one they signed in the Maori language; in the English version, Maori land and interests were anything but protected. The Maori chief, Hone Heke, who was the major proponent for signing, was also the chief who, 5 years late,r precipitated the Northern Wars. Heke expressed discontent over a period of a year by chopping down the British flagstaff flying over the nearby town (Kororareka) on 4 separate occasions. The last time was too much, war broke out, and Heke and other chiefs took the town; in clashes it was burned to the ground (to be resurrected as Russell). I mentioned before that the Maori were a warrior society, living in or near fortified hilltop pas. Male children were trained to be warriors starting at age 5. Maori were good at war, with constant practice (raids on other tribes). They were a Stone Age culture; weapons were wood spears and sharp-edged jade clubs. With European arrival, they also acquired muskets; these were quickly seen as a huge advantage in their wars, and an arms race was on. Many Maori artifacts in museums are the result of trades for muskets with Europeans who treated the artifacts as art objects rather than tools. We’re talking giving up a Maori tribe’s treasures, even war canoes! Missionaries came under huge pressure because they were reluctant to engage in musket trade. One of the Maori chiefs, Hongi Hika, went to London where he had a meeting with the King (! ), who gave him a suit of armor, which on his return via Australia he traded for something like 400 muskets. So when war broke out with the Europeans, the result was predictable but did not come easily. Usually Maori were outnumbered at least 2 -1, but still managed to win half the battles! It was not unusual for the British to lose a third of their assault force, with the Maori warriors slipping away under cover of darkness. Some of the major battles the Maori lost were due to other Maori tribes joining with the British forces (to settle previous scores). These guys were on opposite sides, and I only show the pictures because I find the facial tattoos to be fascinating. The Northern Wars lasted a year, the final fight showing Maori ingenuity. Presaging WWI, in response to overwhelming British firepower, they built gun-fighting trenches and tunnels and withstood 10 days of cannon bombardment and attacks before finally being breached. Let me show you some of the area around Waitangi before going to its cultural center. 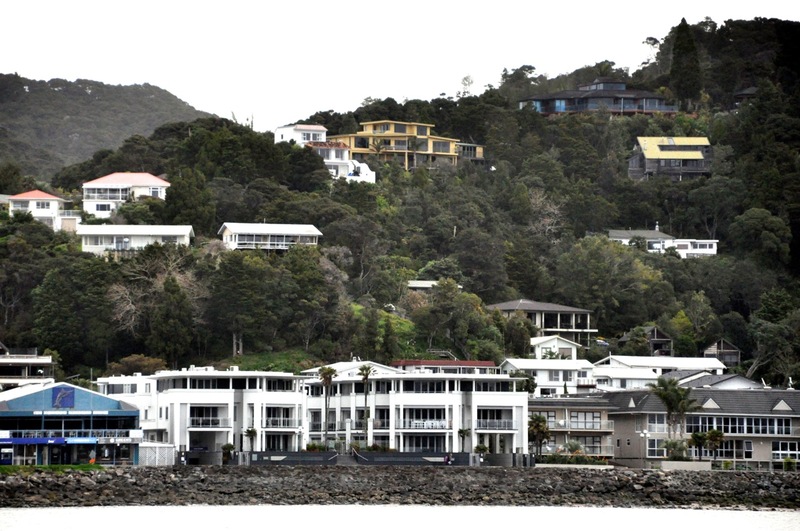 The area below is one of the oldest European settlements with buildings still standing (eg, the whaling taverns and brothels in Kororareka were burned down). 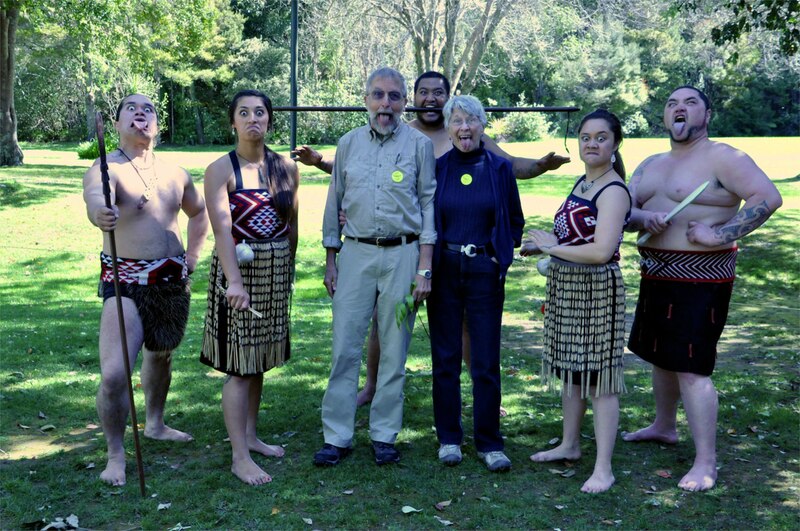 An early missionary establishment next to the pa of Hongi Hika is shown in these pictures. And then it hit me – we think our country is young! This place is a baby! Walking through the missionary house I was struck by how much it reminded me of the time I lived in an old house just off Market St in downtown Charlestown SC (around 1955), in a house that was probably built before this one (although our furniture wasn’t that good, the kitchen was a little better …). Connecticut has a stone house that is 200 years older than their stone house – a difference in years that exceeds Kiwi history in NZ! One of the buildings there is the Duke of Marlborough Hotel, the oldest hotel in NZ, with liquor license #0001. It’s pretty nice; we had lunch there on the veranda. Finally, a view of the Waitangi treaty grounds. They have a Maori meeting house, the signing house, and a war canoe. We took in a performance of Maori culture at the meeting house; we were met by Maori warriors emerging from the meeting house fully armed & doing choreographed movements, chants, vocalizing, all the while demonstrating their prowess with their traditional weapons; this was meant to be intimidating and a challenge, and was it ever! Especially for me, having been chosen the “chief” of our of little group and being the object of their feints. After doing their challenge, one of the warriors laid a “gift” – a palm-like branch – in front of me, to pick up if we came with peaceful intent (otherwise they probably eviscerate me on the spot). We were then welcomed into the meeting house with song and dance. Inside, a ritual song & speech of welcome followed, and I had to respond with my own speech, followed by the hongi, the simultaneous touching of foreheads and noses together & the symbolic exchange of breath with their chief. Much song & dance with explanation followed, along with demonstrations of weapons use and games with sticks that improved limberness, hand/eye coordination etc. One song started as a solo, finished as a duet, and even though it was in Maori, its beauty and emotion moved Ginger to tears. A final group photo. 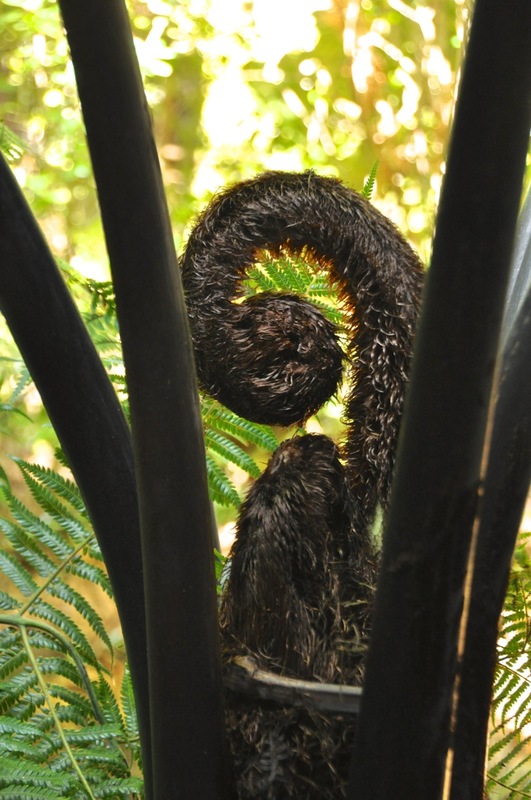 Well, I know, this has been a long post, but let me add a final “art” photo – an unfurling frond from a tree fern. 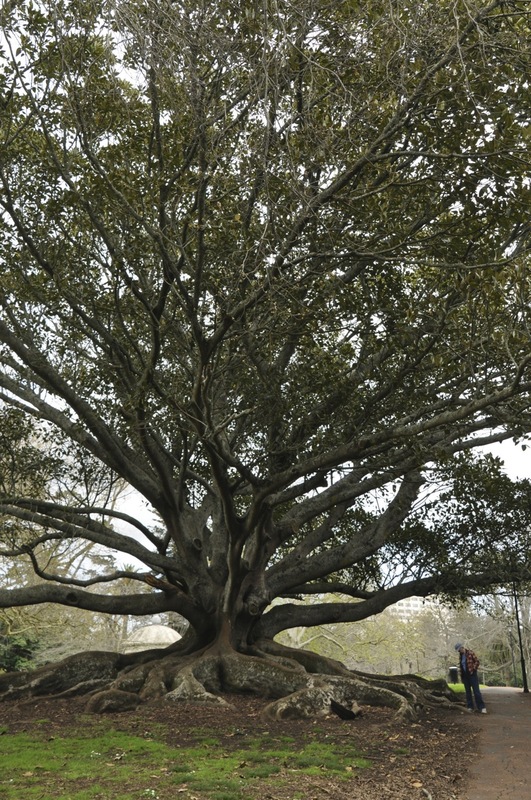 I need a picture here before I bore you with a long story, so here is a pretty tree in Auckland. OK, we need a car. The cheapest I could find to rent for 9 months is $16,000. That’s calling all agencies, even ones in NZ. NZ’s version of “Rent a Wreck” still wanted $12000 for a 2002 Nissan getting poor mileage. There’s a monetary advantage to renting; the credit card gets me free insurance, and I can leave the car in the North Island and rent another in the South Island, avoiding the $500 for car ferry. But still, $16,000? Really? Leasing wasn’t much better, and was impossible to do for a new car. Soooooooo – time to buy a car. I discovered I could buy a used car with guaranteed buy back, thus capping my car expenses. Not any car, mind you, but ones the dealers wanted to dump. Not a new car, usually an older model (eg, 2005, sometimes a 2010, but all before the big push for better mileage). We really wanted a newer, more comfortable car, since we’ll be doing a lot of driving. We finally got a pretty good deal on an inherently expensive car, a 2012 Ford Mondeo, diesel, 15,000 kilometer mileage, with a lot of bells and whistles. Computer for everything – but no navigation system (say what!?). Good thing the boys got us a Garmin! So we bit the bullet and bought the beast (but caveats; drive less than 15,000 km, no damage, etc; I can live with that). So now we need auto insurance (US insurance will not carry over beyond Mexico and Canada). The car dealer said they could get it for us, but this was Sunday and the insurance guys didn’t call back (and I’m thinking, what a way to pad a profit, I’ll find my own). I didn’t mention that while test driving the cars we were considering (driving on the “wrong” side of the road) I kept edging left (curb side), with Ginger gently suggesting that I’m about to broadside the parked cars (in falsetto, no less), and at a red light when I made a left turn I pulled into the far (wrong) lane rather than the curb lane, freaking out Ginger, the salesperson, and all the oncoming drivers before I scooted into my correct lane. Would I insure me? Hmmmm. I visit the big insurance guys in their store (AA), go on-line, get the yellow pages and call everybody with a picture advertisement – same story. You’re a tourist, we won’t insure you; you need a home address here in NZ. Wow, this was just like buying a phone in Spain – I have to buy a house first! So I’m thinking, the auto dealer has some motivation here to find us insurance since we haven’t signed any papers yet. I go from “I won’t buy your stinkin’ insurance” to “pray you can find me any insurance”. And of course they did, and not too bad, really. So all is good. 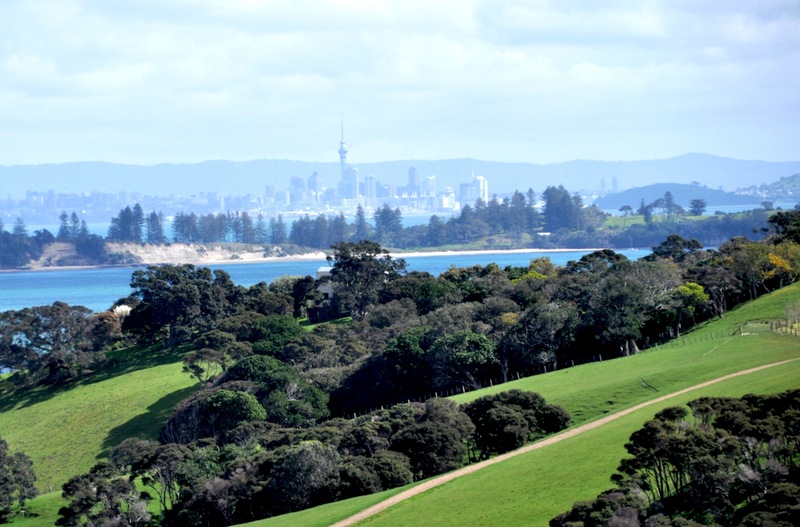 Now to get out of here – say goodbye to Auckland! We left Auckland and put quite a few Kiwi’s at risk of life and limb as I drove north to the Bay of Islands. Ginger was a nervous wreck and kept up a steady (continuous?) stream of “edge of the road” comments. Most roads here are just 2 lanes, rather narrow, and often twisty and up-and-down with no real break-down lanes and sharp drop-offs, and it’s hard to get a feel for where the left side of the car is when your steering wheel is on the right (“wrong”) side of the car. With oncoming traffic zooming by inches from my (right) side mirror I tend to NOT hug the center line and I drift a little (!) bit left. So Ginger was the official left-side audio monitor, which meant she was in charge of nail-biting, leaning hard to the right, and periodically (continuously?) 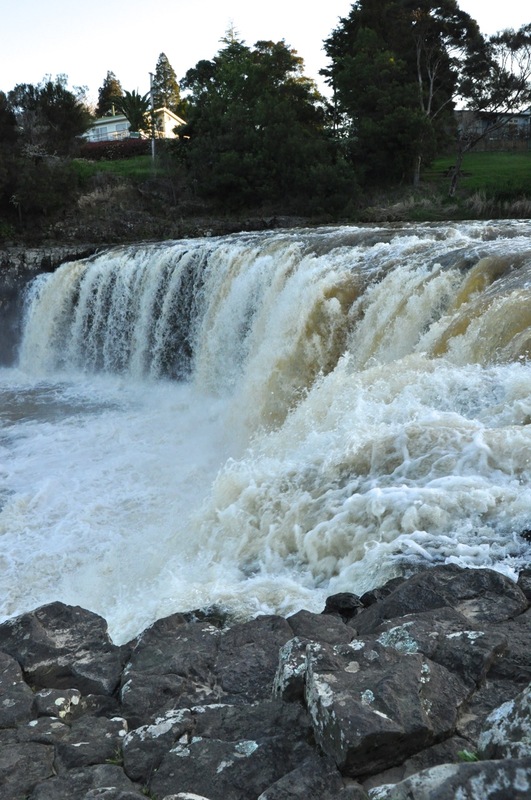 reminding me that I was going of the edge – again! We went to bed last night at 10:30 PM, it’s 9:30 AM now and she’s still sleeping it off. 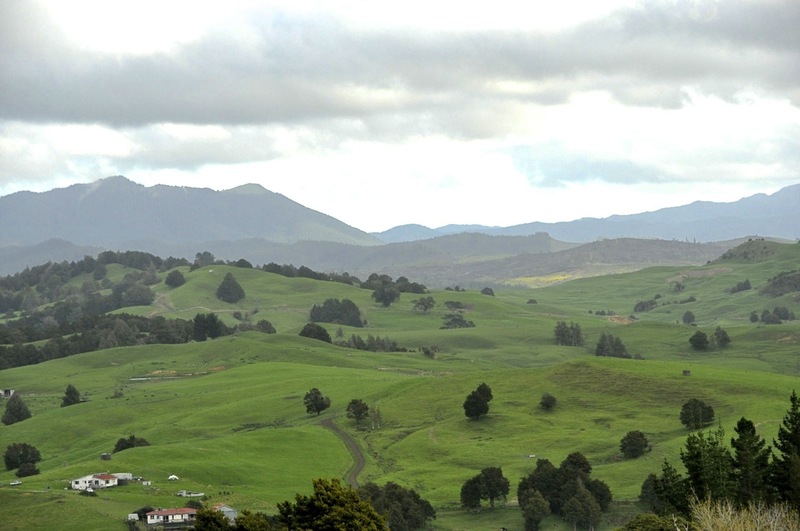 Also attached is a picture of the Northland above Auckland – very picturesque! Lots of cows and sheep! Greener than you can imagine! Almost Switzerland-like. Ginger didn’t want me to look at anything as we were driving (“It’s really pretty, but don’t look”). And if I pulled over to take a picture, she’d scream because we were suddenly lurching off the road (maybe at faster than normal?)…. Somehow we made it unscathed, though. Our place at the Bay of Islands was carefully selected because we were going to spend 10 days there getting the blog up and using The Bay as a base to explore the Northland. 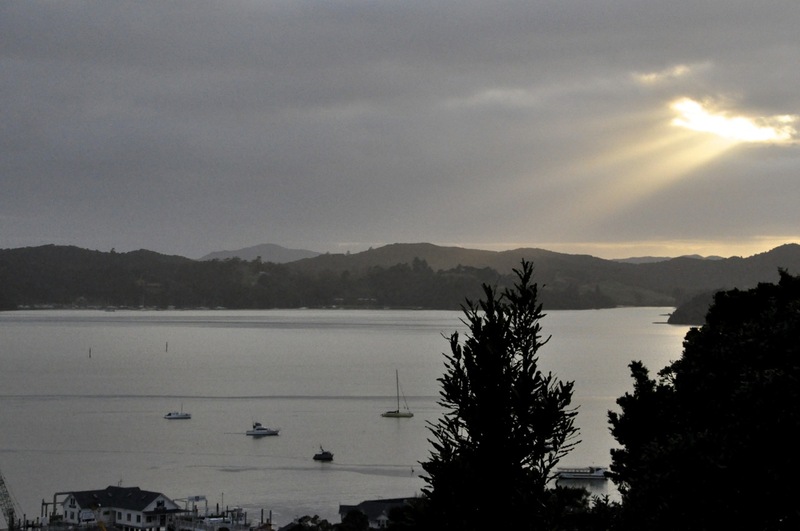 We chose well – an apartment in Paihia, a spectacular place. The picture to the left shows our apartment from the bay – the yellowish one near the top, center. And then there is the view out to the bay. Mesmerizing, really. 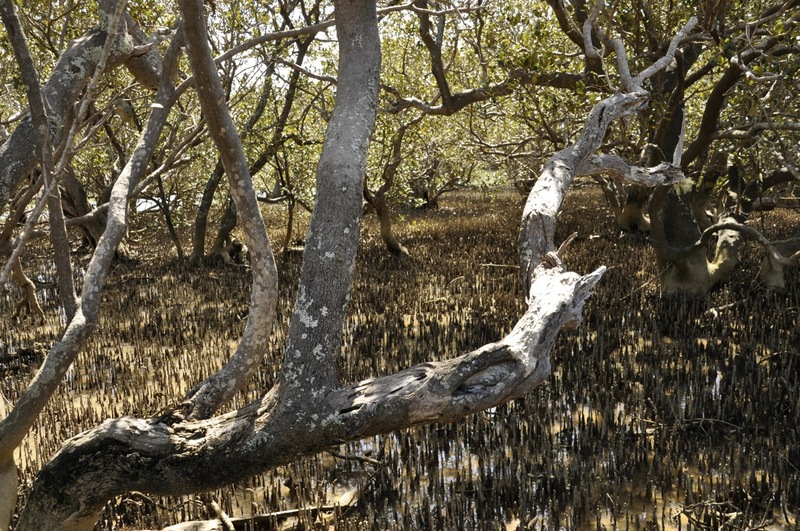 This is a piece of paradise, ours for a short while. The pictures below show a portion of the view from our deck …. In other words, it was spectacular from anywhere. And like the sea, never the same from one moment to the next. 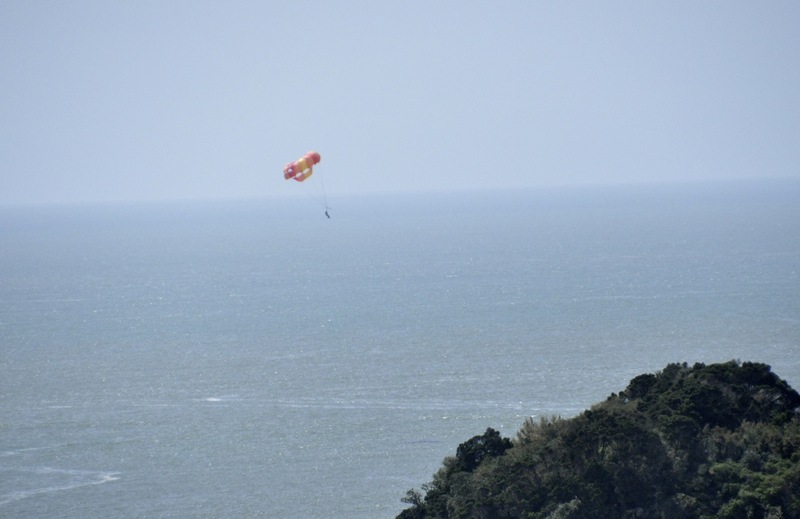 Plus, this is New Zealand, so you get boats, and sailboats, and ferries and … parachutes? Are we surprised? Not really. I’m going to close with a picture of an unfurling frond from a tree fern here on property (tree ferns and flowers are everywhere), and then a picture of “live music on Sunday, 3pm -6pm)” from Al Fresco, a local bar/restaurant. 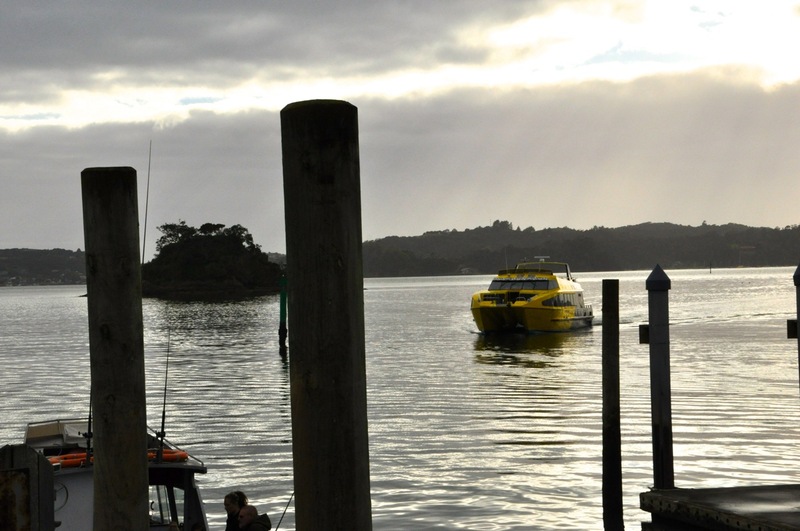 Paihia is a huge tourist destination – very busy in the summer. 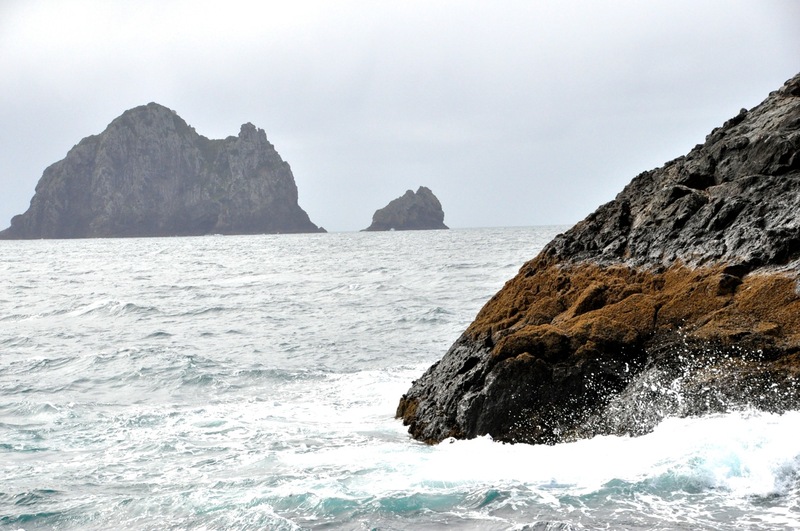 Almost all tours come here to view the islands and swim with the dolphins. Nevertheless, there’s less than a thousand people living here, and it’s a small town. The music venue was cute. The band wasn’t bad, a lot of the people knew them, and you had a lot of 3 generation tables. Grandma and grandpa were tapping their feet. The food wasn’t great but hey, can’t have everything. I ordered a pot of mussels (I love mussels), and was surprised when the pot came out with like 8 mussels in it, protruding from the bowl. Each mussel is about 8-9 inches long, which pretty much fills the pot. The mussels are big! Arnold Schwartzenegger mussels. Unfortunately quite tough and chewy, kinda like unbeaten octopus. Bummer! Maybe they’re better elsewhere. We’ll see!